I’m glad to say I thought this second book was much better than the first. It seems like Maas really just gave us a long set up in book one that is now really starting to flesh itself out in book two. I felt way more connected to the story line and the bigger picture of the plot and outside world. 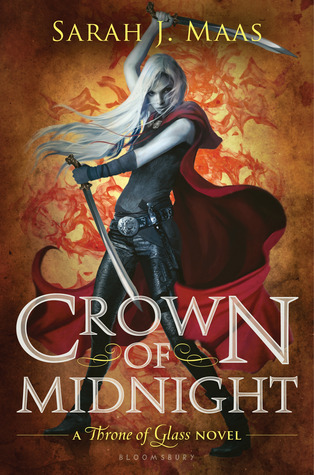 I also felt like this second book was way more of a fantasy than the first book. Instead of magic only being something forbidden and lost from long ago, we actually got to see the characters discussing and interacting with magic. The stakes were higher in this book and I felt way more invested the in the characters than the previous book. Also if you know my taste at all you know I’m a romance junkie so I definitely enjoyed getting more of that in this book. Again I still really like Chaol (cautiously) and I feel like Celaena’s reaction towards him later in the book is a bit petty and overdramatic but the girl’s been through a lot so it would probably be less believable if she responded any other way. I was surprised by Dorian’s development in this one and I’m really excited to see how this plays out. One of the most interesting parts of this book was getting a small POV from the king. And spoilers aside, I’ll just say I didn’t trust a certain someone from the beginning and it felt pretty satisfying to be validated by that reveal. The big reveal at the end wasn’t a surprise to me due to all the hints as well as it being obvious from any information on the internet about the series. But I will say I was glad it was finally confirmed and revealed to at least one character instead of remaining a “mystery” into the next book. I liked how the book kind of set us up for a classic quest but Celaena is just so reluctant to participate in her hero’s journey. She remains stubborn, selfish, and arguably cowardly until she’s met with a breaking point. And even then she’s only just starting to maybe get on board with her destiny when a wrench gets thrown into the plans, though I think she’ll still end up exactly where she needs to be. I’m glad the series is getting better with this second book and I’m starting to see even more why everyone is obsessed with this series. I also thought that Celaena’s reaction toward Chaol was a bit overdramatic. I didn’t feel like it was fair to blame him for everything. I’ve had this series on my radar for a while now. I haven’t committed yet, but I know it’s just a matter of time. Thanks for the review… you’re inching me closer to taking the leap! I just did a mini spoiler free review of books 3-5 if that helps too! the final 7th book was just published so you can binge away!